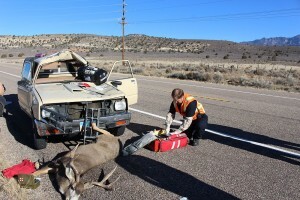 WASHINGTON COUNTY — A 200-pound buck crossed state Route 18 just north of Diamond Valley Wednesday morning, leaping over one car safely but landing on the hood of a small truck, sending the buck through the windshield and severely injuring the driver, who was subsequently transported to the hospital by Life Flight. It was on (the east side) of the road running full speed (and) jumped from that side of the road. I never even saw it on the road. I thought she had hit it. Eight feet in the air and lands right on the hood of that truck. 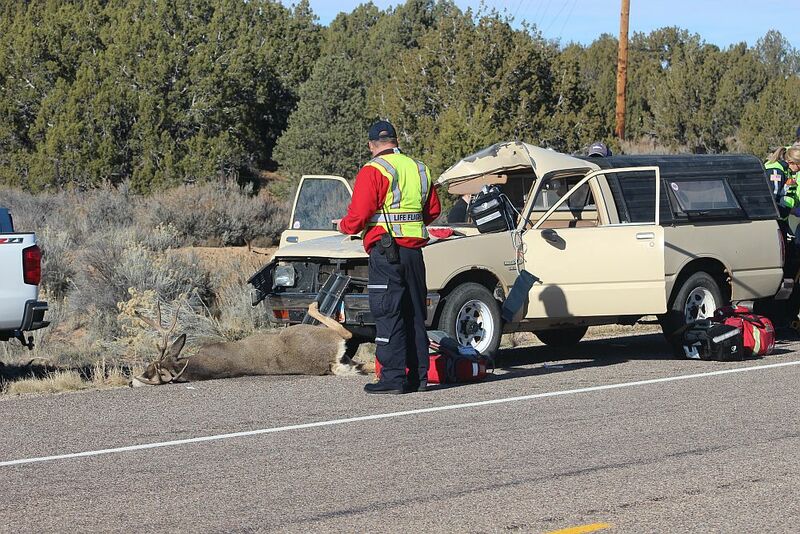 The buck landed on the left side of the truck’s hood, Pastor said, and rebounded into the windshield and roof of the truck, causing extensive damage to the structure of the vehicle. 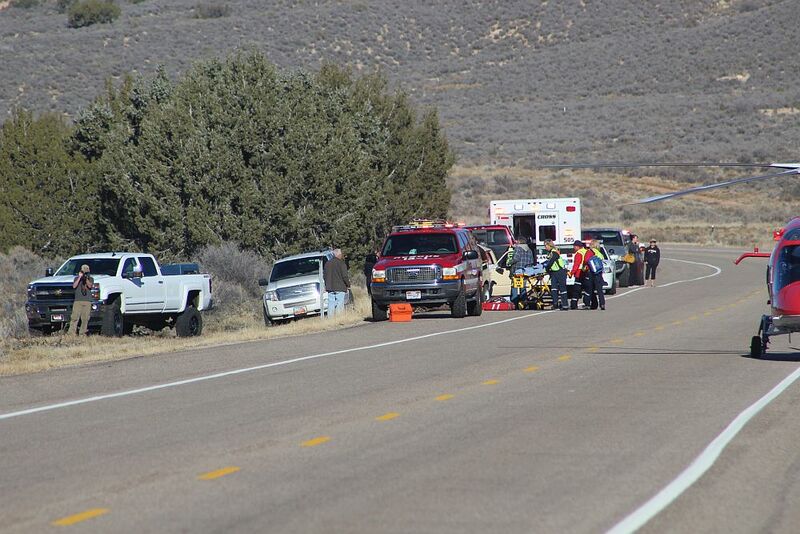 The man, approximately in his 70s, driving the truck sustained a severe laceration on his neck, Pastor said, and was transported by Life Flight to Dixie Regional Medical Center in St. George to be treated for his injuries. State Route 18 was completely shut down from 9:58 a.m. to about 10:30 a.m. in order for Life Flight to land its helicopter. 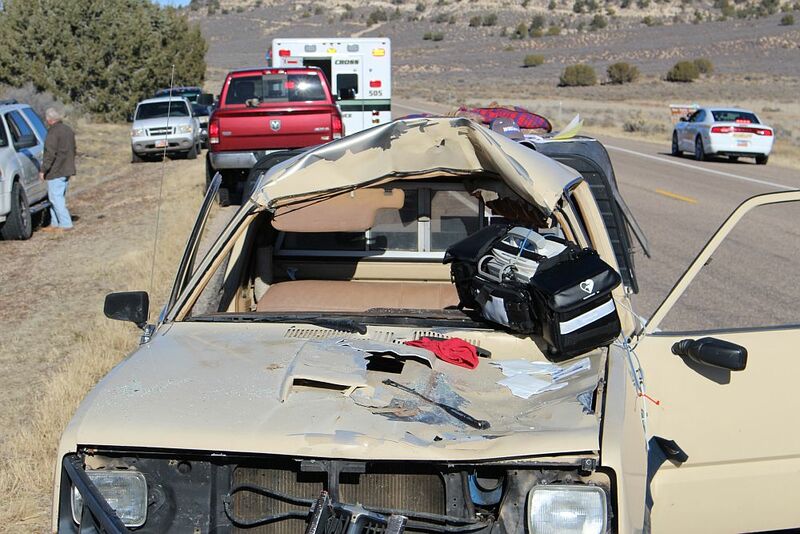 Speed was not a factor in the incident, Pastor said, and all occupants of the vehicles were wearing their seat belts. No other injuries were reported. 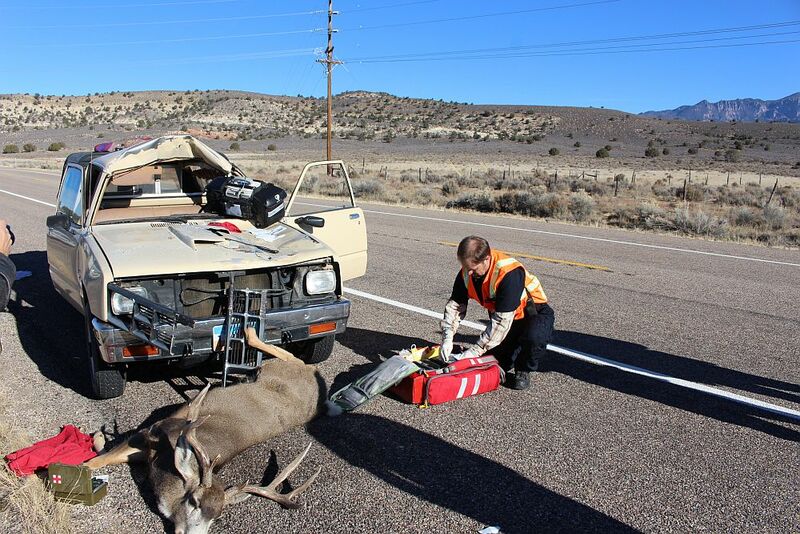 When a deer is killed on the highway, 95 percent of the time the meat is unusable, Division of Wildlife Resources spokesman Lynn Chamberlain said. Chamberlain said the trauma causes an instant release of a hormone that renders the meat unpalatable. People seem to forget, this time of year, deer are out both day and night. Keep your eyes open. Ok Wilber, this deer came out of no where, I didn’t see him until he was hitting the roof of my car and jumping over my car. He had been spooked or something and was on a dead run. I live in Dammeron so I know the deer are out, they are everywhere and I’m always looking for them but this one I couldn’t have done anything it happened in a second and it was very scary for me so thank you for your concern!! Hey Wilbur. Say hi ! to Mr Ed for me ! Deer trek through my place all the time . On many occasions I’ve seen them go from dead still to leaping a fence or bolting away . Making it even harder for humans is that their coats blend really well into the landscape when they are standing still . the thought of having it happen at 70 is just scary . Hope his recovery goes well . 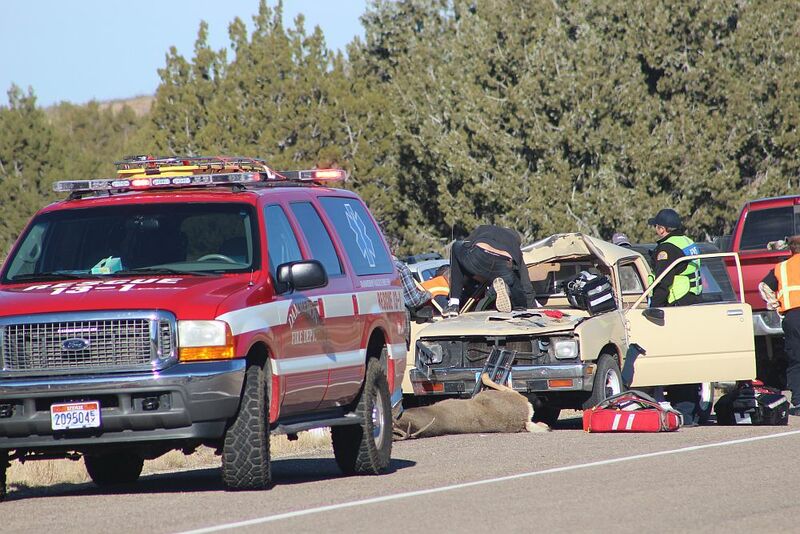 I’m thinking- For the protection of all SUV’s, Maybe it time for the BLM to close down another road or at lease make it a toll road.